Features an overlap back tie. One tie at the neck and one at the waist in the back. 5X-Large - Blue Print Pattern 7" 85" 46"
What is sweep? 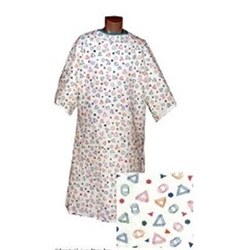 Sweep is the circumference of the bottom hem of the patient gown. The sweep is measured by laying the article of clothing flat, with the seam matched up, and measuring end to end. Then multiple the number by two to get the sweep measurement. Generally the larger the sweep the larger gown.